Home > Organizing Tips > Organize with Kids > Organizing with Your Kids: A long term perspective pays off. Right before we left for Michigan, my daughter got spring-cleaning fever. She was in the mood to pitch things like she’s never been in the mood to pitch things before. Now, if you’ve taken any of my online workshops, worked with me one-on-one, or have been reading this blog for a while, then you know this: this was a huge development. See, my girl loves to hang onto things. She loves her stuff — all of it — and really if she could, she would keep all of it. She’s a sentimental girl, who is attached to all sorts of things, even pajamas. I remember one decluttering session years ago where she did everything in her power to convince me a way too small pair of p.j.’s still fit her just fine, even though they were way, way too small. So when this girl is ready to let things go, this momma is happy to jump on board, regardless of what was already on my to-do list. “No, I don’t miss my stuff. It looks so nice and clean. I don’t know why I held onto that stuff for so long.” She answered. And the Hallelujah chorus erupted! Okay, that last part about the chorus didn’t really happen, at least not in my office, but it sure did in my head. This was a huge moment! Seriously. Huge. In fact, for over seven years I had been planting the seeds for this moment to happen. 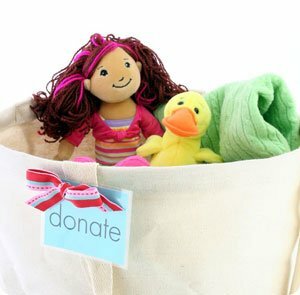 For the past seven years my daughter and I have decluttered her room several times a year. The progress was slow but steady. She always let things go, but she’s also always held on tightly to things. And she has always pushed the limits of her room’s true storage capacity. Now I could have forced her to let more go over the years. But I’ve always maintained a long term focus, giving up a bit of order in her bedroom for the promise of giving her something greater—a sense of control and ownership in her surroundings. I believed that my role was to teach her how to let things go, and to make it safe to let things go, but also to make it safe to keep and honor the things that matter to her. At times this was uncomfortable for me. At times I felt like her room didn’t look like I thought other people would think her room should look. I am a professional organizer, after all, so shouldn’t her room be, well, perfect? While I didn’t believe that, I did struggle with what I thought others might think. But in the end, I let what I thought was best for my child, both in the short term and the long term prevail, as uncomfortable as that was. My goal was that she knew how to organize and let things go, and that her room was functional for her—that she could find her clothes and shoes, and do her homework—but if it was a bit more visually cluttered than my personal preference, I let that be okay. Here’s the thing. When getting organized, you have to be ready to let things go. This holds true for adults and for kids. My girl woke up one day last week ready. So ready in fact that she kept going on her room all on her own. In the space she cleared out by getting rid of the things that no longer mattered to her (dolls, etc. ), she stored her furry friends (stuffed animals) which really matter to her a lot. She let go of books and papers and trinkets and treasures…all on her own. Is it perfect? No. But is it darn good? Oh yes it is. All those years of working slowly, remaining patient, and putting her in the driver seat of her room…finally paid off. So for all you moms out there with kiddos who cling tightly to their things, my advice is this: know what your long term goals are for your kids. 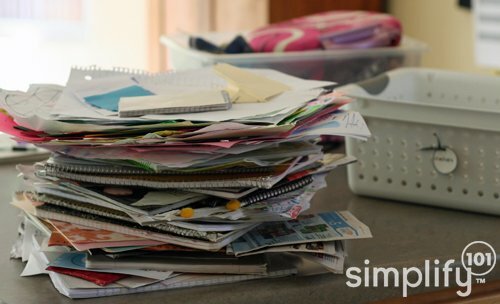 When it comes to decluttering and organizing, what do you want them to know how to do before they leave home? Then, maintain a long term perspective, and work move gradually in the direction of those goals. And know this, in time, you and your kiddos will get to where you want to be. Okay, Moms, I’d love to hear from you. When it comes to organizing with your kids, what’s your biggest challenge? Thanks for sharing. Aby, reading your post made me realize that perhaps the reason that I hold on to things is because when I was a child my dad used to organize and purge my room without me being there to make decisions. I never realized how that affected my adult behavior. Hopefully, with this in mind I will be willing to let lots more go than I have in the past. Thanks for all your wisdom and encouragement. Wow Aby! I had the exact same experience with my daughter! Over the years, I have been bothered about her room and her things – more because of my discomfort and what I felt her room should look like through the eyes of others. Over the years I have helped her do “small declutters” with the intention of helping her see how good it feels to let things go and free up her space. Those experiences were always very stressful for her, so I sort of backed off. Recently she came to me and asked for my help in cleaning up her room so she could re-arrange and create a more “pre-teen” type of space. She was amazing and really showed me that she did learn something from those first attempts to teach her how to let go of things:) Now that she has the room that she loves – she is maintaining it on her own beautifully! I no longer cringe every time I walk in! I am so glad I listened to my instincts and let her decide to do this when she was ready! She now has such pride in her space! My two biggest hurdles are letting my perfectionist tendencies go, and having kids who are at an age (maybe all ages are like this?) where every little thing is a treasure to them. I know I’ve made more work for myself by always wanting cleaning and organizing done my way… and I’ve taught my family that I’ll always be the one to do it. That’s not right! My girls love how their room looks (uncluttered!) now that I hung shadowboxes and frames to display their most important treasures, but every time they come home from a party or play outside there is another beautiful rock or kazoo or piece of plastic that they “must” hold on to. I’ll be checking out all your resources on organizing with kids- thank you! Thanks, Michaela. My daughter was definitely the kind to hang onto everything…rocks, trinkets from parties, popped bouncy balls, you name it! So there is hope that your girls will get past it, too. I think you’re definitely on to something when you point out your own perfectionist tendencies and letting those go. I think that was one of the biggest struggles for me, too. Nothing beats an organize and clean home. Even if you have a nice home, if it’s not organize then the design will be useless. Your organizing tips really helps a lot.